After six thrilling performances, the curtain has finally closed on our 2019 production of Agatha Christie’s Witness for the Prosecution. Congratulations the the amazing cast and crew who have put so much work over the last few months into making the show a success. A massive thank you to everyone who came and saw the production, we hope you enjoyed it! 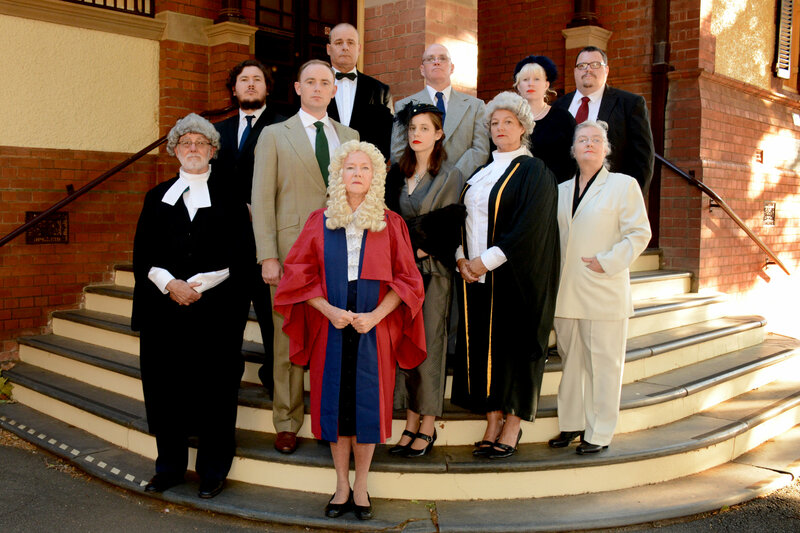 Wagga RSL/Commercial Club presents the second production on the Wagga School of Arts calendar for 2019, “WITNESS FOR THE PROSECUTION” by Agatha Christie, directed by Julian Smith and has a cast of experienced well known actors and some newcomers. Based on a 1925 short story and much adapted for screens big and small, Christie’s play is easily her most ingenious. A trial is the essence of the plot and the accused Leonard Vole, played by Jackson Balme, is full of misinformation, lies and some devious plotting by the women he has encountered. The play’s appeal lies not just in its mystery but in its courtroom formality and its reminder that the law itself is a theatrical ritual: apart from the dressing – up, the rival counsels are engaged in an ostentatious personal battle in which they shamelessly appeal to the jury and seek to ingratiate themselves with the judge. Witness for the Prosecution opens on Friday 5thApril at 7.30 pm. Bookings are now open. 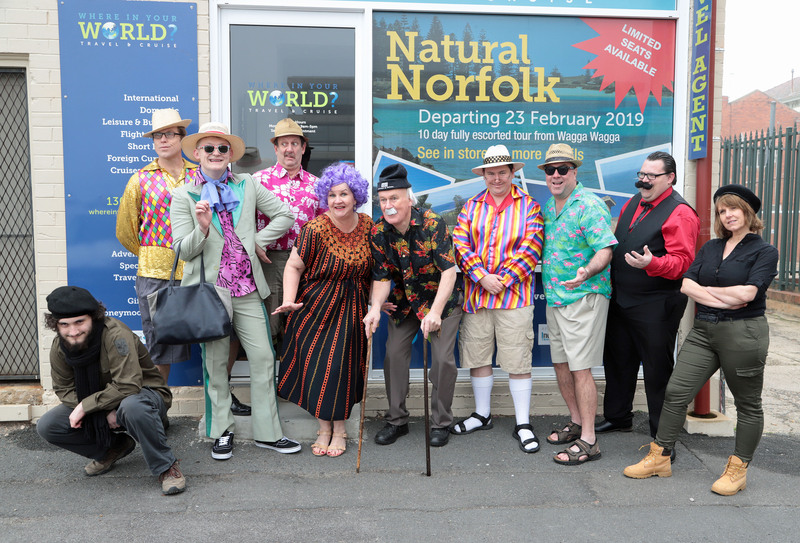 The cast includes, Tony Trench, Lauren Walker, Jackson Balme, Margaret Bannister, Kristil – Rae Mobbs, Jenny Ellis, Antonella Salvestro, Harry Nixon, Tony Woods, Logan Franklin, Adrian Hallam Tracey Lonergan, Craig Dixon.,Saasha Mc Millan. Audiences will be delighted with the surprise turn of events, when they become the jury for the trial. run until February 24 th in the Basement Theatre. dialogue….just singers and songs to delight. and happiness all rolled into the landscape of life. Opening the 160th year of SoACT, Love Bites by James Millar and Peter Rutherford is a song cycle musical revue about falling in and out of love. A long time theme of relationships captured in music, song and dance. Seven couples share their stories, the talented cast of seven play all seven couples: this in itself is a great challenge which they have risen to with great enthusiasm and expertise. The revue highlights all the unlikely places couples meet and start their relationships, including an aeroplane, a florist shop, a mountain top or strolling through a zoo… One never knows where love can be found! The overall diversity of this musical revue engages the audience in their stories and allows the audience to travel with them through the tender meetings to the sometimes triumphant, sometimes tragic conclusions. The strong sparkle of satire, wit and innuendo is ever present in the show with the strong vocal ability of the cast and the energy of choreography will keep the feet taping and audience wanting more. This is an original Australian work directed by Melissa Donges, with vocal coaching by Leah Ellis and pianist Hannah Caterer. Mel Donges had also done the choreography for the show and plays one of the many roles. Mel has a long history of great work in theatre in Wagga; Love Bites is her first time in the director’s chair. Love Bites opens on Sunday February 3 at 3pm at the Basement Theatre and has a season running each Sunday of the month until February 24. A special date-night offer to celebrate Valentine’s Day is set down for the evening performance of Sunday February 10. Buy one ticket get the second free, a welcome champagne on arrival, plus a gift for each couple. An ideal way to celebrate Valentine’s Day and see the show! 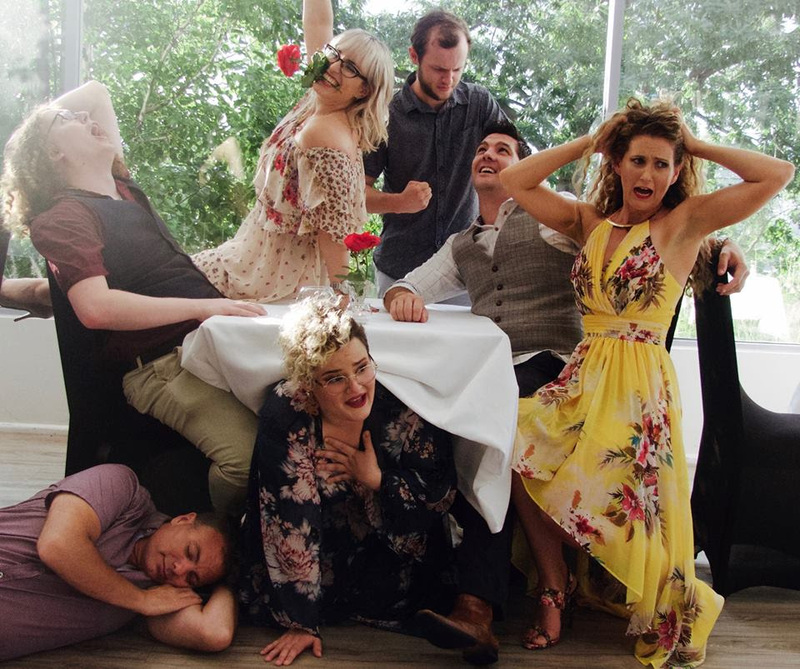 The first production in the 2019 160th Anniversary Year for Wagga School of Arts Community Theatre is LOVEBiTES a Musical Revue written by James Millar and Peter Rutherford. SCOBELL’S PLUMBING is presenting this first production which is being performed in the February Fun Days Slot. – Sunday’s in February commencing on 3rd. The director is Melissa Donges, a well know actor, singer, dancer and choreographer and SoACT is delighted that she has volunteered to direct this show as it is full of songs, dance and great comedy. Auditions have taken place and the cast has been chosen resulting in a very talented ensemble. The cast are Iain Wright, Leah Ellis, Dominic Hort, Tim Phillips, Jessica Brodie, David Downey and Mel Donges. The Musical Director is a newcomer to Wagga Hannah Caterer, and Choreography is being undertaken by Director Mel Donges. This show is all song and dance, and will be one of the highlights of theatre in Wagga in 2019. Council employee by day to ‘flamboyant director’ by night, one Wagga local is rising to the challenge. 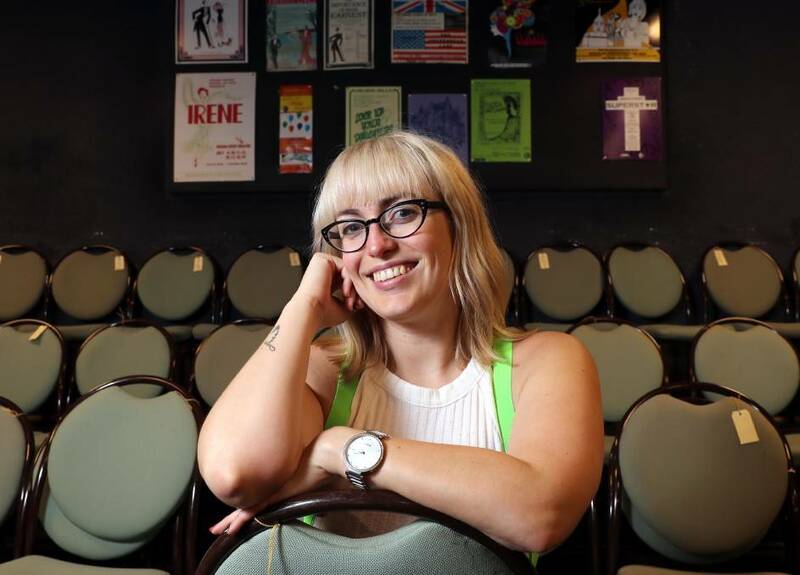 Mel Donges, 33, will be directing School of Arts Community Theatre’s first show for 2019. Ms Donges said she will be leading a cast of seven, with three females and four males.“This is my first one to direct,” she said. “I am very nervous, but also very excited. Ms Donges said she has a very hands-on approach especially considering her background as a choreographer which she will also be using for the show. Members of the cast are Iain Wright, Leah Ellis, Dominic Hort, Tim Phillips, Jessica Brodie, David Downey, and Ms Donges. Musical director is a newcomer to Wagga Hannah Caterer. 2019 is almost upon us, so get ready to be entertained by yet another great lineup of shows. In 2018 just about every performance was close to, or completely sold out so don’t delay in organising your tickets. First off the rank is “LOVEBiTES”, our February Fundays feature, followed by an Agatha Christie special – “Witness for the Prosecution”. The “Ten x 10” Playfest that showcases aspiring writers as well as actors and directors is in June, followed by “Absolutely Fabulous” as our August Month of Sundays offering. Last but not least, “Venus in Fur” in October, rounds off our season for 2019. But yet there is more!!! 2019 marks the 160th year that SoACT has been running, and there are plans at foot for some extra special entertainment events throughout the year…so watch this space. 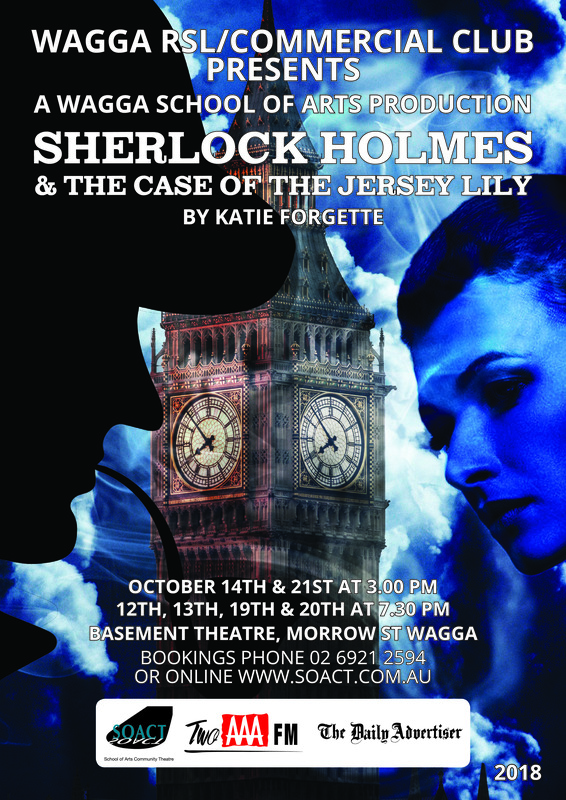 Rehearsals are under way for the Wagga School of Arts Community Theatre and their October production of Sherlock Holmes and the Case of the Jersey Lily presented by Wagga RSL/Commercial Clubs. This production is under the direction of Josh Steadman, who has returned to Wagga after an absence of some years. Josh is assisted by Margaret Bannister for this production. In casting Sherlock Holmes, Josh has selected a cast of well-known actors, some returning to SoACT after some years. Iain Wright is one of these actors and he is in the role of Sherlock Holmes. As the final production in the very successful 2018 season this show promises to deliver top entertainment coupled with some mystery and intrigue as the plot is revealed. Wagga School of Arts …SOACT has enjoyed sell out performances for most of the shows in 2018 so it is very important for our patrons to get their tickets early. As Director, Josh Steadman brings to the show a wealth of experience and to have him on board for the final offering is a great bonus for the Wagga School of Arts Community Theatre. As an actor Josh was last seen as Mr Rumbold in Are You Being Served. SoACT’s next production hitting the boards is the ever popular “Are You Being Served” by David Lloyd and David Croft. This show had a long life run on British TV, from 1972 to 1985. 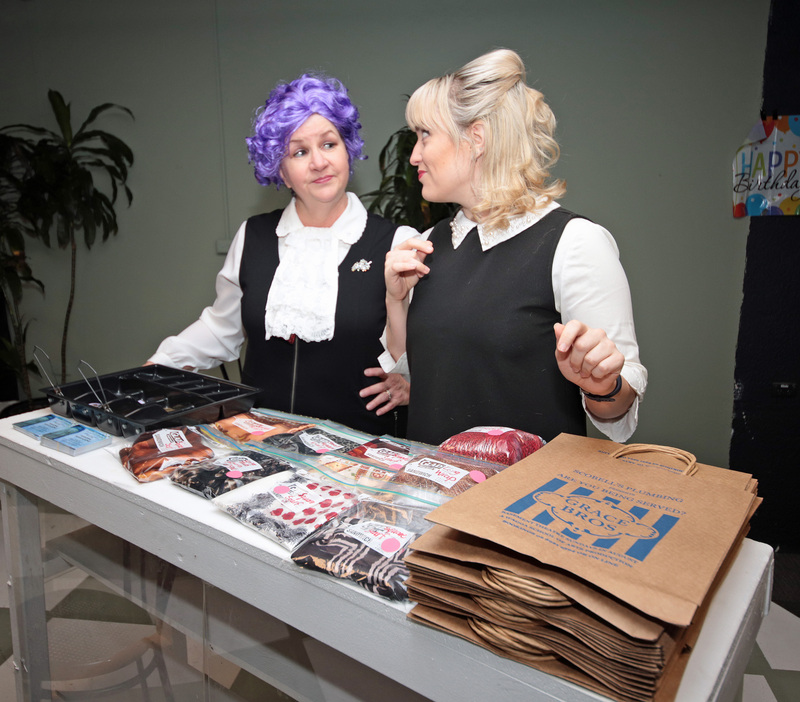 Set in a fictional Department Store, Grace Bros it revolves around sales in ladies, and gent’s departments. The comedy of the show keeps the laughter bubbling throughout and one can barely draw breath for the entire show. Director Anna Swift has put together an excellent cast of experienced actors to play the very colourful roles. The list actors include Lynden Clark, Patrick Kenny, Mel Donges, Shaun Perry, Blake Smith, Harry Nixon, Josh Steadman, Craig Dixon , Adrian Hallam, Antonella Salvestro, Amber – Rose Walker, Cassandra Nicholson, Damian Triulcio. Bookings are now open for this wonderful comedy and tickets are selling very fast. The show opens on Sunday 5thAugust at 3 pm and runs Sundays in August through to 26th. So make sure you are free! 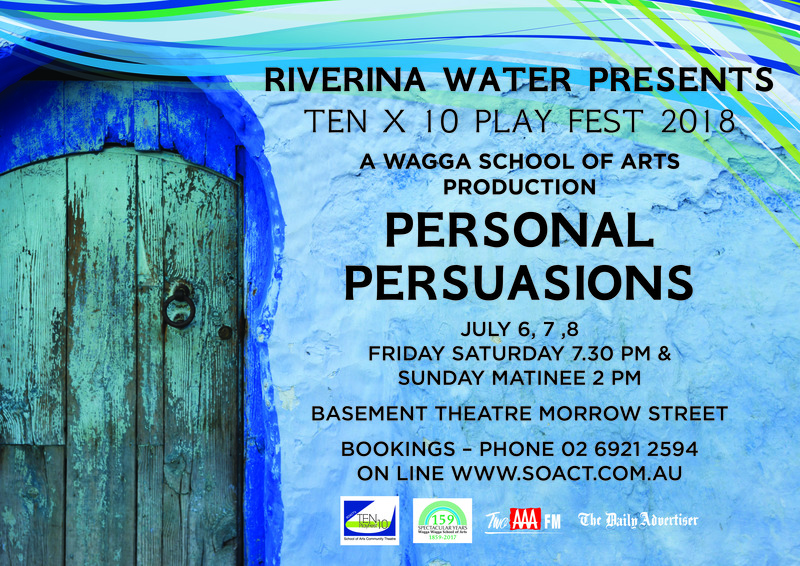 A great weekend of variety and entertainment is guaranteed with 2018 Personal Persuasions Ten X 10 Play Fest at the Basement Theatre.